I just redeemed my Sephora birthday gift this year, and was thrilled to see that they are now offering VIB and VIB Rouge members 250 points as a gift option in 2019! I selected the 250 points instead of deluxe products, but you can also select a Kat Von D. gift, a Drunk Elephant gift or a Milk Makeup gift. I have drawers and drawers filled with deluxe samples, and therefore selecting the points was a great option for me. 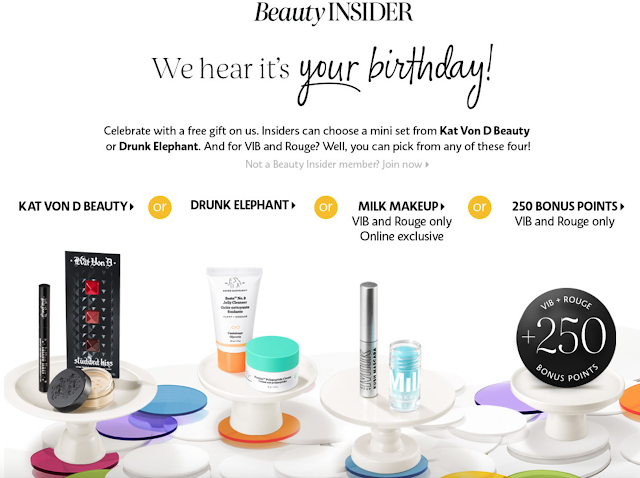 *Beauty Insiders are eligible to redeem one birthday gift per year. 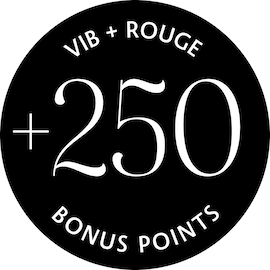 250 bonus points and the surprise online-only gifts are only available to VIB and Rouge members. In-store redemption: no purchase necessary. Redeem in Sephora or Sephora inside JCPenney stores during your birthday month by providing your Beauty Insider email address. Online redemption: a merchandise purchase is required. Redeem two weeks before or after your birthday and any time during your birthday month. Offer not valid on jcp online. If you are having problems redeeming online, please contact customer service at Sephora.com/contact-us. Substitutions may occur. Valid while supplies last. This offer is subject to change, alteration, or termination by Sephora at its sole discretion at any time. I picked the MILK because Kush mascara is just terrific. That alone is $12. And I wanted to try the blue thing but it doesn't seem to do anything. I like their assortment this year. That was definitely a good choice, Marcia! I like the assortment this year as well, and I was really happy to receive the 250 points! They always have great birthday gifts until mine rolls around in Dec.
Hopefully this year there are plenty of great choices by December. At least they can't really run out of the points! Nice to get the bonus points! Definitely, and I have so many deluxe samples that I will never get to, that the points just made so much more sense for me. I'm glad they're offering the points because I'm really not into the other options this year.